The history of hydroponics gardening goes back quite far. It wasn’t until the 1800’s that scientists discovered that plants basically absorbed their nutrients from water. The scientists found the soil in which they were planted only supported the plants and was a mineral reservoir for the root system. Consequently, many plants will grow in a soil-less environment. Hydroponics gardening is best described as an indoor growing system without soil. The term was coined in the 1930’s and is derived from two Greek words meaning water and work. All that is required for plant growth is a combination of nutrients, light, temperature, and humidity. Virtually any plant can be grown by this method. This system of gardening system requires a solution of mineral nutrients/fertilizer appropriate for what you are planting. You can mix a solution of your own or you can buy ready-mix bags that come in a wide range of formulas available from a variety of sources that are much easier to use. The plants can be grown with the mineral nutrients/fertilizer solution in expanded clay pebbles, gravel, polyurethane foam, perlite, sand, and rock wool. When the days grow shorter with less sunshine, you need to provide the plants with grow lights that supplement the amount of light they need to sustain growth. For most hydroponics gardens, there are several types of lamps. There are fluorescent, high-pressure sodium and metal halide. Most gardeners prefer metal halide lamps because the quality of their light is good for healthy plant growth, flowering, and are more desirable to work around. 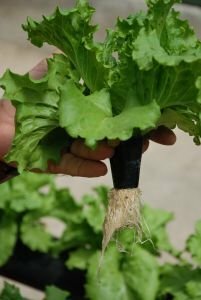 There are advantages associated with hydroponics gardening. Commercial growers believe that this method of growing plants increases the length of produce freshness time when delivered to markets. It provides commercial and home growers a better growing environment when good soil is not available. Soil diseases are eliminated. No weeding is necessary and the total volume of water consumed might be lowered especially when irrigation is needed in fields. Disadvantages are that the nutrient solutions need to be monitored for proper pH, the build up of soluble salts, and the proper concentrations of nutrients, as well as the proper temperature of the nutrient solution. Since the growing medium is basically inert, the plants will react faster to imbalances in any of these areas.